Junior forward Alyssa Gorecki looks to pass down ice against UNH Oct. 20. Gorecki was named Hockey East Player of the Week Nov. 13 after scoring two goals against defending national champions Clarkson University. 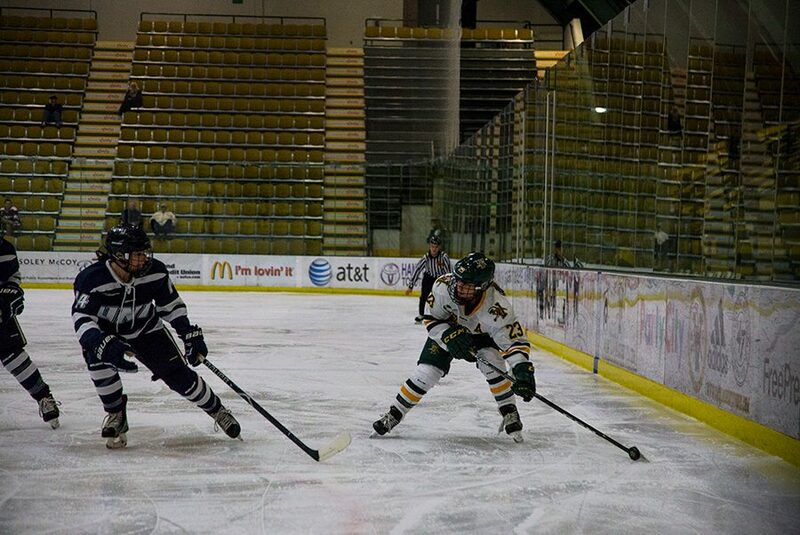 A UVM women’s hockey player recently received an award from the Hockey East conference. Junior forward Alyssa Gorecki was named Hockey East Player of the Week Nov. 13. Gorecki received the award for her two goals in Vermont’s upset of reigning national champions No. 3 Clarkson University. A native of Monee, Illinois, a town located 40 miles south of Chicago, Gorecki began playing hockey at the age of five, she said. However, getting into hockey was not something she planned. That love, combined with her skills, would eventually take Gorecki to the U. S. national youth ranks. In 2015 she suited up for the red, white and blue at the International Ice Hockey Federation’s U18 Women’s World Championships in Buffalo, New York. She posted two goals and three assists in the tournament as the U.S. won gold. One of her goals came in the gold medal game, which the U.S. won over archrival Canada in overtime. “The entire experience of representing your country is pretty indescribable, and I am very honored that I was fortunate enough to have that opportunity,” Gorecki said. Gorecki took her talents to UVM for the 2015-16 academic year. Playing a top-six forward role, Gorecki posted 13 points in her debut season in Burlington, tied for third on the team. She followed that up with a 25-point sophomore season in 2016-17, second on the team. 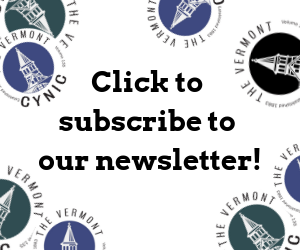 Gorecki took her play to another level in the playoffs, posting six points in the quarterfinals against Providence, a series Vermont won in three games. She also scored the tying goal in the third period of the Hockey East semifinals against Boston College. There’s “something special” about these big games, Gorecki said. “I definitely look forward to every game, but there is something about games where we can make a statement,” she said. Gorecki currently leads the Catamounts in scoring with 13 points. As an alternate captain, she leads not just with her in-game production, but by helping the team’s many younger players. Gorecki is looking forward to the rest of the team’s season, she said. “We have shown that we can compete with anyone, which makes me anxious to see how things will go,” Gorecki said.